I’ve found the stock windscreens on motorcycles just aren’t very good at their job. I’m 6′ 2″ tall and the screens on every motorcycle I’ve owned or ridden over the past 20 years seem to be setup for riders much shorter than me. They excel at creating a flow of rough air that hits somewhere between my neck and forehead. Even the Concours 14’s adjustable windscreen hasn’t been able to solve this problem. Now that I’ve had my Connie for 6 years, and have no plans to buy a new bike in the future, I thought I’d spend a little money to see if I could finally fix this issue. After much research I landed on the VStream® Tall Touring Windscreen. My goal was to find a screen that would provide a clean-ish flow of air over the top of my head, make sure there was sufficient airflow during the summer to keep me cool, and provide decent protection in cooler temperatures. Weather protection in the rain was also at the top of my list. In short, I wanted a do-it-all windscreen for all seasons and riding conditions. Its been 2 years since I purchased the VStream®, so I’ve given it a fair long term test. VStream® Tall Turing Windscreen left, stock windscreen right. This windscreen is tall, that’s not just a marketing term in the title. At slightly over 2 ft. it’s practically a sail compared to the stock screen. In the highest position on the Connie, I can just see over the top (on straight roads). Coupled with the generous fairing on the Concours it creates a pocket of protection that the stock screen cannot even hope to compete with. When it’s raining, as long as I don’t stop, everything behind the screen (head, chest, shoulders, lap) stay bone dry. I’ve ridden in some pretty decent storms over the last few years and been thankful for this level of protection. Being almost as wide as it is tall (height: 24.10 in, width: 21 in.) I was concerned about the tall screen blocking too much air to keep me cool in the summer. This was not the case. The unique “V” shape of the screen creates a relatively clean flow of air over my helmet while allowing a stream of air to slip around the screen. Setting the height of the windscreen on the Connie at the 2nd pre-set position sends this stream of air right along and under my arms. The combination of the airflow over my head and along my sides also pulls air from my back. This is ideal for mesh jackets and those with underarm and back vents. “The typical airflow pattern of the wake from most windscreens is called a van Karman vortex. At speeds of 50-90 mph, the air swirls off the windscreen in an approximate 90-degree segment of rotation, hits the bottom of the rider’s neck on the way up, and curves off the shoulder at approximately 45 degrees. I can personally attest that these claims are accurate and true. With the adjustable screen on the Connie I can direct where the stream of air created by the “V” shape hits me and in essence control how cool or warm I want to be. Great for summer riding but also very useful when the mercury starts to drop. Installation was easy. The screen attached to the existing mounts on the Connie with no additional hardware needed. I had my old screen off and the new one installed in about 15 min., 10 of which was spent searching for my allen socket set. As I stated before this screen is tall. At highway speeds it flexes quite a lot. This does concern me regarding its longevity. My hope is that the polycarbonate material is strong enough to not crack where I feel it’s week spot is, the mounting screw holes. According to Nation Cycle, “All VStream® Windscreens are made from thick, durable polycarbonate with National Cycle’s exclusive Quantum® hardcoating or FMR hardcoating.” In two years of commuting and long highway trips I have seen no issues, but it’s still a concern for me. The flexing can also disrupt the otherwise clean air flow produced by the screen. At highway speeds, in traffic, the disruption of air caused by other vehicles coupled with the flexing of the shield can create some buffeting and noise. No more than the stock shield, but it does defeat the special design of the screen. This is not an issue when riding back roads or at lower speeds at all. The VStream® Tall Touring Windscreen has all the features I was looking for when I started my search. It provides good weather protection, clean airflow, and good control of that airflow to keep me cool in the summer and warm in the spring and fall. I’m very happy with my purchase. National Cycle offers the VStream® series windscreens in Sport, Sport Touring, and Tall Touring sizes to fit most motorcycles. Check out their entire catalog at NationalCycle.com. You can purchase VStream® windscreens from most online motorcycle stores. I bought mine from Revzilla for $179, not cheep but well worth the price. Normally in the fall my friends and I take a four or five day riding trip that helps me get through the winter. This year we were not able to pull off our trip and I feel like somethings missing. I really look forward to this long ride capping off the regular riding season, but now it seems unfinished. I’m not one to stop riding when it gets cold, but I do ride less in the colder months than in the summer. Partly this is due to me being lazy and not wanting to winterize my bike. It’s also because there are always those 60 degree surprise days that pop up all through winter and I don’t want to not have a bike to ride when they come around. Generally I’ll ride as long as the surface road temps are above 35 and the outside temps are around 40. I’ve collected a gear set that keeps me warm on my commute. With a little more layering I can go on long trips without getting cold. A few weeks ago two friends and I took a day trip into Luray, VA for lunch and a to ride the surrounding area. It wasn’t exceptionally cold but we did see snow on the side of the road as we crossed Sky Line drive on Rt. 211. My winter kit isn’t anything special. It’s gear that I’ve collected over time and found works for me. I have Dainese TRQ-Tour Gore-Tex Boots, Smartwool tall ski socks, FirstGear TGP insulated riding pants, TourMaster insulated/windproof riding jacket, Aerostitch 3 season Vegan gloves, and a fleece neck warmer. For longer rides I will also put on my Cycle Gear FREEZE-Out base layer long sleeve top and long johns. I’ve been satisfied with my winter gear so far. The recent addition of the FREEZE-Out base layers has extended my riding range a lot. It’s light weight and breathes well keeping me warm but not hot and sweaty. My bike also has heated grips which are a huge help and allow me to wear thinner gloves but still have warm hands. How long into the winter do you ride? What do you do to keep warm? Electric heat or no? Leave a comment and share. I’d love to discover your secret to staying warm so that we can all use it and be able to ride longer into the colder months. 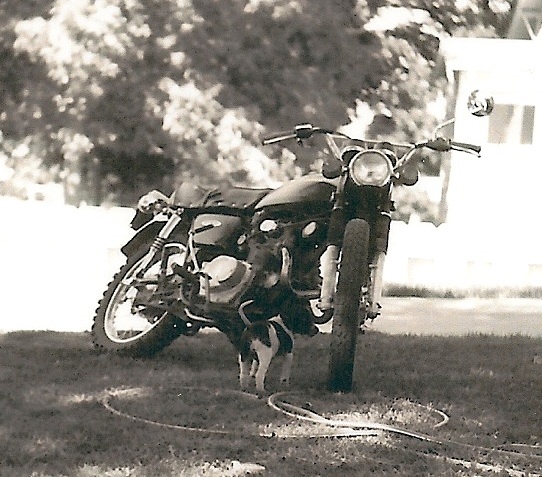 My introduction to motorcycles was riding on the back of my dad’s 1980’s Honda. I can’t tell you what year or model it was. I do remember my dad taking me and my sister, in turns, on rides through the then country roads around our house in Bennion, UT just outside Salt Lake City. Back then my riding gear was a t-shirt, shorts, sneakers and a purple metal flake helmet that barely fit. I was big enough to reach the pegs from the passenger seat but not tall enough to avoid the pipes. A good number of our weekend rides ended with both my sister and I in the bath tub running cold water over pipe burned patches on the backs of our legs. My dad bought the Honda after a break from riding for several years. When I was in my teens he would tell me stories about running around in the canyons and fields near Tooele, UT, where he grew up. He had a number of bikes when he was young and spent a lot time fixing their broken parts or recuperating from his broken parts. My grandmother used to tell me she never thought he’d live past 15 the way he tore around on his motorcycles. After having kids and settling into work and family life he decided to get another bike. Unfortunately like many of us life, family, work and in the case of my dad a bad back, caught up with him and he sold the Honda. In all honesty I don’t remember its departure at all. It was there one day and then it wasn’t. I didn’t think much about motorcycles again until I was in my mid twenties. My sister and I were out of the house on our own and my dad’s work had settled down some. Time to get a new bike. This time he was able to get the bike he had wanted for a long time, a Harley-Davidson Ultra Classic Electrglide. 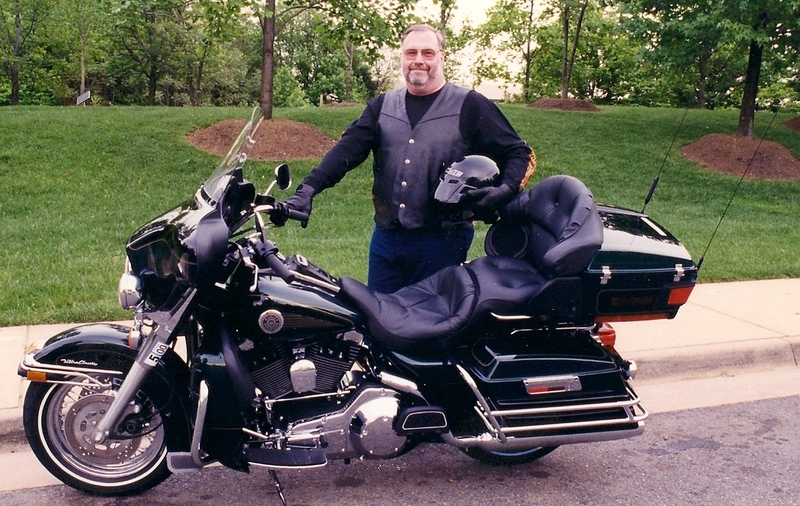 There are few times in my life that I’ve seen my dad happier then when he was riding his Harley. It wasn’t long before the entire family got excited about the idea of riding motorcycles. Before we knew it dad bought a Suzuki Savage 650 as a learner bike. First my sister learned to ride, then me. Originally the bike was to teach my mother how to ride but she realized early on that the pillion was the place she felt most comfortable. My sister, having earned her motorcycle license, never really caught the bug. I, however, got hooked immediately. So with no home for the Savage, I decided I’d volunteered to take care of it. That was the first of several motorcycles I was to own. My dad and I went on several rides together. Not nearly enough now that I look back. Our favorite ride was down Rt. 55 to a country store that sold home-made doughnuts. Then it was off to find some country roads and a good lunch. Honestly it really didn’t matter where we went, it was just fun riding. When I got back into riding I bought a Harley Electraglide too. I’d taken a break for many of the same reasons that my dad had; new family, new house, work, etc. The choice of the Harley was purely an emotional one. When I saw it, I thought of my father who had passed away a few years before. It was a connection to him that I needed to have and so I bought it. The bike was bigger than any I’d ever owned. I really had no business riding it, but I needed it. There were times when I was riding the Harley I imagined I could feel his hands over mine on the grips and sense his smile as we motored through the countryside. I can still feel that now. It’s a large part of what I love about riding.